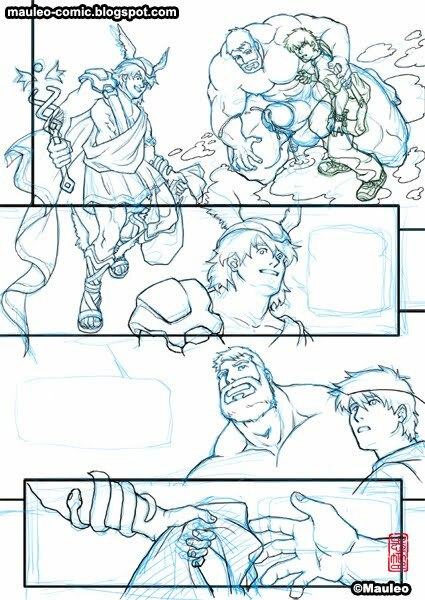 This is the Sketch of the first page of "Hercules PowerUP Chapter 2 (part 1)". This time I'm putting in dialogs for the characters, so the story can be more interesting. but English is not my Primary Language, I can't come up with clever lines/speeches like most writers do. Chapter 2, is divided into "2 parts", Part 1 is 24pages digital format. the release date is around September 20,2010.
is $20 (USD) to expensive? any opinion on the price? If you have a script in Mandarin, I'd be happy to help translate into English. I hope you always have Hercules available in electronic edition or PDF the whole thing. For those of use in countries where we can't printed gay comics, we would truly apprecciate PDFs.